Filmmaker and sociologist Astra Taylor has written an excellent and much-needed book about Internet technology, culture and economics, critiquing the so-called “Web 2.0” phenomenon. In the beginning of the book, Taylor sets up the supposedly false dichotomy of the debate about the Internet: techo-boosterism that sees everything about the Internet as great vs. Luddite anti-technology naysayers. However the rest of the book reveals that dichotomy to be kind of a slight of hand distraction. Taylor spends most of the book talking about how mainstream discussion of the Internet and its political and economic implications tends to be framed as a debate between the political center and the political right, with positions of the political left excluded. Taylor tries to inject a leftist position. So she critiques the likes of Lawrence Lessig for advancing what amounts to a Standard Liberal Position (i.e., the political center): finding the “right” amount of inequality. Taylor, on the other hand, advances the (largely blacklisted) Standard Left Position, which seeks an egalitarian society. She sees too much in common between the liberals, the fascists, the royalists, and the libertarian right, and therefore offers a politically different perspective, one that many people probably would agree with, except that they never hear it in the mass media. She particularly objects to the neo-feudal aspects of “Web 2.0” that are premised on a neoliberal, techno-libertarian obsession with creating tycoons and massive inequality, without a democratically-controlled government to act as a check on private power, and tries to reveal the mechanisms those boosters try to conceal. This is the essence of social science. She fits into a long line of writers from Thorstein Veblen to Peter Drahos to Nicole Aschoff. Perhaps most on point in a general sense is Luc Boltanski and Eve Chiapello‘s influential The New Spirit of Capitalism, where they make the argument that corporate capitalism is co-opting the empowering rhetoric of the past (the New Left 1960s especially). Aschoff explicitly cites Boltanski on this point in The New Prophets of Captial. Taylor just adopts that same argument (perhaps reinventing the wheel a bit). But Drahos’ Information Feudalism is quite apropos too. A rather similar observation about growing neo-feudalism has been made by the economist Michael Hudson, who has noted how the “free trade” of classical economics was meant to promote an economy freed from feudal aristocracy, rentiers, and any other predatory interests who sought to siphon off wealth through special legal/social privileges, whereas the neoclassical economics of the neoliberal era seeks to set up an economy free for predatory interests to set up wealth-extracting privileges akin to setting up private tollbooths on otherwise public thoroughfares. Taylor’s book sets out a kind of narrative that maps rather well onto Hudson’s theory. For Taylor, the problem is that (a) Internet technologies are praised for the socially beneficial possibilities they suggest, with those possibilities backed by lots (!) of paid advertising. Despite considerable media attention, (b) little attention is paid to whether there is empirical validation for the theoretical possibilities that Internet technologies suggest. It is assumed that internet technologies produce positive results without many people bothering to check. Most importantly, (c) only those internet technologies that bolster concentration of wealth and capital are supported — those who do check up on empirical circumstances and report on the disconnect between theory and reality are marginalized and ignored. This last point is crucial. Usually the internet technologies that succeed are not the ones that actually provide the benefits they suggest, but rather ones that meet the dubious criteria of venture capitalists and Wall Street, which are — quite intentionally — never listed as being socially beneficial, because they tend to be parasitic and socially corrosive. It’s a shell game. Attention is drawn to dead ends and pipe dreams while the real and often repugnant drivers of the widespread adoption of these technologies drift into the shadows, away from public view and scrutiny. Taylor re-frames the question, away from that of the mainstream media and tech-boosters (often one and the same people), and toward the vetting process that lurks in the shadows. She instead asks the great question of the ancient Roman Consul Lucius Cassius: “Qui Bono?” (“to whose benefit?”). The answer to that question is usually a small minority, often morally repugnant violators of user privacy and owners of parasitic platforms hosting content by those whose labor is exploited. In many ways, Taylor’s analysis also mirrors that of Jeffrey Reiman‘s “Pyrrhic Defeat” theory in criminology: while a Pyrrhic Victory is a victory that comes at such a great cost that it amounts to a defeat, “Pyrrhic Defeat” is a nominal “defeat” of stated objectives in which those with power to alter the system benefit from the actually-existing conditions of “defeat”. One key debate involves those who want the Internet to be a free-for-all, and those who want draconian control over it. While it is unsurprisingly a small but vocal minority that adopts the draconian approach, there are flaws in the other, free-for-all argument too. Taylor cites Elinor Ostrom, Peter Linebaugh, and other defenders of the commons against those who frequently take a right-Libertarian view of the Internet as a (market-based) “commons”, pointing out that, “In reality, differing circumstances, abilities, assets, and power render some better able to take advantage of a commons than others.” (Taylor doesn’t touch on it, but Michael Hudson has again written about “free trade” theory as causing economic polarization in much the same way). Taylor suggests that having a commons is socially-beneficial but to succeed requires regulation and enforcement of democratically-determined regulations. In other words, she once again sees the mainstream debate as being between the political right and the center-right, to the exclusion of a politically left position, which she adds to the debate. Much like Aschoff, Taylor picks apart the fundamental insistence on neo-liberal capitalism embedded in “Web 2.0.” Drawing from the writings of Alice Marwick, she notes how online “self-branding” and relentless self-promotion is really about an insistence that neo-liberal political values be internalized. Any other views are marginalized. A similar argument was taken up by Miya Tokumitsu with her book Do What You Love, exploring how the injunction to do work that you love masks promotion of inequalities, victim-blaming and anti-labor sentiment. It also has been the subject of some in-depth writing on the so-called “sharing economy” subsequent to Taylor’s book. The book is written in a “journalistic” tone, but unlike most books of that sort that rely on dubious citations (if any) and anecdote without a coherent underlying theory, The People’s Platform is much, much more informed. Yes, some of the citations are still a bit light (many are digressions rather than clear support for her statements). Perhaps the biggest issue is Taylor’s injection of her subjective perspective as an independent documentary filmmaker into the book. This proves useful, in that it allows the reader to clearly identify her own point of view, given that every writer has one (some just refuse to admit it). Mostly Taylor’s own personal narrative provides examples to illustrate concepts she develops more generally. She does an especially good job conveying the nuance of the debate over intellectual property, and especially copyrights, noting how creative workers rely on it for income, while the “Web 2.0” companies use Internet software platforms to develop audiences that are sold to advertisers without any feeling of obligation to pay a living wage — or in many cases, anything at all — to content producers whose works are distributed on those platforms. Those who want everything to be free and open tend to be those who don’t depend on such compensation to survive. And yet, Taylor does kind of overlook an old argument of the Standard Left Position. In the Nineteenth Century, the third best-selling book in the United States was Edward Bellamy‘s Looking Backward, a Rip Van Winkle tale about a man who goes into a trance in 1887 and wakes up in the year 2000 to find an essentially socialist utopia. What is interesting is that in that fictional socialist utopia Bellamy suggests that novelists are not compensated. They raise their own funds to publish — though there is a job guarantee so every citizen has a right to other gainful employment in a socially useful occupation. The key difference is that Taylor assumes (without explicitly discussing it in her book) that it is socially desirable to have “professional” creators of cultural/creative works. Bellamy suggested that an ideal society should not have such full-time content creators, but instead such things should all be done on an amateur basis, albeit in a society that provides ample leisure time and guaranteed income to enable substantial self-directed work to be performed. This is a small loose end, though, in an otherwise thorough treatment of the topic. 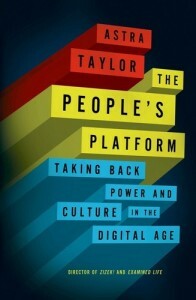 In terms of the suggestions for the future, Taylor (implicitly at least) draws form the likes of Richard Wolff in suggesting cooperatives online, Robert McChesney in suggesting that media delivery companies should be taxed at full market value to eliminate the advantages that their natural monopoly or quasi public utility positions give them (e.g., for exclusive broadcasting licenses), and that content producers should be directly subsidized by the government. While many books like this that critique and criticize the existing state of affairs tend to fall down by making a bunch of absurd and/or unrealistic policy recommendations, Taylor is thankfully brief and vague about specifics, but offers a multitude of general suggestions that point toward improvements that could be pursued individually or all together. They aren’t really new suggestions but they are meaningful alternatives. She does, however, stop short of suggesting that neo-liberalism or capitalism as a whole be jettisoned, even though that is implicitly (and obviously) where her arguments point.